Texas bluebonnets make traveling over flat, expansive prairies and rolling country hills a delight. The big state of Texas loved the flower so much, it was named the state flower. This wildflower grows in varying shades of blue; some flowers even appear more white than blue. 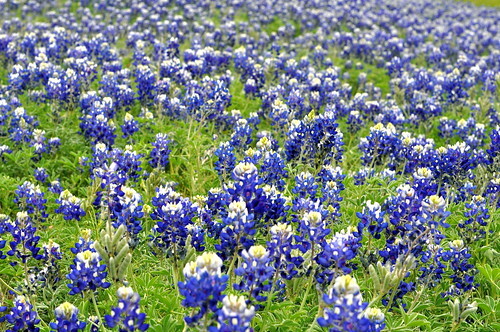 Besides the popular bluebonnet, Texas is home to other vibrantly-colored flowers commonly grown around the state. Calico Bush The lantana calico bush is a member of the verbena family. What makes this flowering bush so unusual are the changing colors of the blooms. The flat, small flowers first appear with bright yellow petals, but, as the flowers mature, the color turns orange, then bright red before the blooms fall away. Although these Texas flowers are pretty and colorful, the flower’s aroma is unpleasant to smell. It blooms from February to December. The native Spanish dagger is a yucca plant, one of two varieties commonly found in Texas. This cultivar has sharp, pointy leaves that protect the flower’s stalk. The stalk produces a fluffy arrangement of small, white flowers that can be eaten and are very attractive. A useful plant, the roots can be used to make natural soaps, and the leaves of the plant are tough and durable enough for use as fibers. Prickly Poppy Argemone mexicana has many names including prickly poppy, queen thistle and bird-in-the-bush. This flower is a heavy seed producer and sprouts easily with little or no special soils or care. This flower has white, sometimes lavender, silky flat flower petals with a yellow center. The prickly poppy gets its nickname from the thorns that grow along the grayish foliage. People who handle this poppy should use caution; damaged leaves will ooze a sap that irritates the skin. Indian Blanket Indian blanket is the common name for the Gaillardia pulchella, a member of the Asteraceae, or sunflower, family. According to the University of Texas, Indian blanket, also known as firewheel, is one of the most common wildflowers in the state. The foliage of this flowering plant is a bright or deep green. The flowers are wide, noticeable and resemble their sunflower cousins. The center of the flower resembles a soft button which later sheds seeds. The bloom has multi-colored petals in hues of yellow, orange and red — sometimes on the same flower. These flowers appear from April to July.